Imogen Clark competing in the Butterfly. When it comes to competition, Derbyshire can mix it with the very best on a local, district, county, regional and national level. At the very top, the Derbyshire Insititute of Sport provides support for athletes who are not yet funded by their national governing body (NGB) but are performing to a level where it is believed they can progress to that elite level. Alongside that runs the ICON bursary programme for talented athletes who are tipped for further success in their respective sports, and are either already competing for England or Great Britain or are part of recognised national development squads or club academy structures. All of the athletes are tipped for further success in their respective sports, and are either already competing for England or Great Britain or are part of recognised national development squads or club academy structures. The School Games are hugely popular. 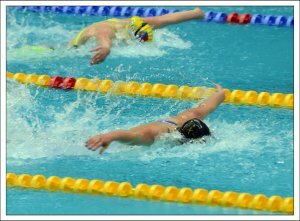 But there is also a strong emphasis on competitive sport locally, particularly in schools, where some of those taking part will be competing for the very first time. 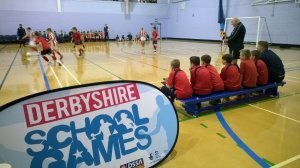 The Derbyshire School Games, administered by the Derbyshire Schools' Sport Association (DSSA), provides that opportunity and those who excel can, in some competitions, go on to represent Derbyshire at a regional and national level.